Hilburn houseboat for sale, are they good house boats to buy? Is a Hilburn houseboat good house boats to buy? Thinking of buying a Hilburn houseboat for sale, and wondering if they are good house boats to buy for inland and coastal cruising? We would be traveling around the ICW and short hops out on the open water. We have seen them with V8's and also diesel engines, any ideas as to which are best? Thanks for any help. Mike. Well Mike, welcome to the houseboat forums, and congratulations on your decision to buy a Hilburn house boat. Now if the boat passes the marine survey, and the price is right, than you can't go wrong with using a Hilburn for inland and short coastal cruising. They were well made houseboats, and with solid construction. If you can get one with diesels, that would be my choice, but again, have a mechanic look at the engines and the drives, just to verify their condition first. Lastly, hopefully some of our owners and readers will share and post comments about their Hilburn houseboat experiences. Feel free to use the "Click here to post comments." link found near the bottom of this page. 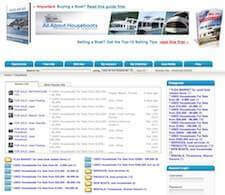 Comments for Hilburn houseboat for sale, are they good house boats to buy? 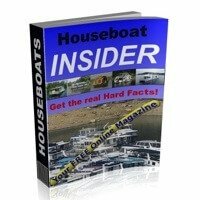 I’ve been shopping and getting educated for a year now about houseboats; the old houseboat guys blogs are very helpful. I’m tired of dragging my 5th wheel to Lake Powell and pulling my runabout in tandem (triple tow), it's time for a houseboat. I know it’s a long shot but a guy named Allen posted about having owned a Hilburn with twin fords and jet drives. He’s a previous owner, he has info that would be helpful to me. This boat is rare and is sitting in Page right now. I’m pretty sure it’s his old boat, he spoke highly of it. If Allen gets notification of this thread please reach out to me. We have the 1987 14' x 41' boat mentioned above that Ken owned for 11+ years. We bought it from Bruce when we saw it 2 years ago at Mobile County River Delta Marina in Creola Alabama. We still have the boat there and it continues to be the maintenance-free boat that Ken described. The original inboard has been replaced with twin outboards and we prefer the gas outboards. A 3ft transom was added when the conversion was made, so technically we now have a 44' boat. Hey everyone, I am actually in Germany and have an opportunity to buy a 1984 Hilburn houseboat for a decent price. I have a friend who will check the engine in TX were the boat is. My concern is that I will not have a chance to test drive the boat. Is this an easy boat to drive? I am a "beginner boat driver" and am worried I may not be abe to handle a boat of this size. I have a 42' Hilburn houseboat, it was a rental boat and we are now looking at some roof repair & protecting it. Does anyone recommend a product we can apply to protect & seal the roof. I've had recommendations for tiff coat 2 part epoxy & Sherwin Williams epoxy base & sheercrete. I have a 1987 53ft Hilburn houseboat and have had it for about 11 years. Not the fastest on the water, but very reliable and well built. We bought it as a pleasure craft and is certainly that. Would recommend one to anyone who is not in a big hurry, we have found that getting there is just as much fun as the main event. My husband and I are the very proud owners of a 62 foot 1987 Hilburn houseboat. This is our 2nd year of ownership and are also looking for any manuals associated with the Hilburn houseboats. I would also be willing to pay for manuals as they would provide a wealth of information needed for our updating of the houseboat. We truly love our Hilburn and had searched long and far before settling on it. Bought the above boat which had been poorly redone. We are restoring her to her former glory and would love to have any manuals available for her. I am willing to pay for a copy if anyone has one. As a marina owner, you really need to consider the type of fuel you will require. Diesel is increasingly getting more difficult to locate along the coast of Florida. I could not justify Diesels in my 14'X44' Hilburn rental houseboats. We own a 1989 Hillburn houseboat, registered by previous owner as 14' X 62', but actual hull from marine survey rated 59.5'. She is the Southerner. From what we can tell, we are the third owners. The boat is very sound and handles extremely well. We use it on the lower Potomac River so we deal a lot with wind, current and, of course salt. Seems like we are always doing some type of maintenance/repair, but it can always be traced back to poor work/care by previous owners. We love the boat and as we maintain and improve it, we plan to use it for a lot more years. Our problem is a lack of information/resources. Seller passed on NO manuals. I have SEVEN Hilburn houseboats that I have been renting since 1984-85. The hulls are aluminum and are great, their well constructed and have passed the test of the general public. The down fall is in the cabin construction, after a few years, we have had to replace the roof to bad glass work and proper trim sealing... as well as not to bright of individuals diving off the rails helping to rip the screws loose. Under normal use, private, it would propably last a lifetime. All gas powered, can't justify the cost of the diesels even as rentals. These boats have served me well and now I'm retiring the fleet. We own a 1987 14' X 41' Hilburn houseboat and have had it for 11 years. We have had great service out of it. It is well built and very enjoyable boat. It is maintenance free. The name of our boat is Bandit and we have it on Holt Lake at Tuscaloosa, Alabama. I'm an original owner involved in a multi-owner organization that has a 1989 Hilburn Custom. It has twin 4 cylinder Ford engines with Kodiak dual stage jet drives. We just replaced the engines after 12 years of usage. The jet drives were replaced about 10 years ago (had the hamilton brand jet drives in it before). It's not the fastest houseboat on the lake but I've always found it to be maneuverable and it can go in places that pontoon houseboats can't even consider. The power train requires very little maintenance. I own the Hilburn houseboat in your picture at the top of this section. It has twin Volvo AQAD30A diesels and with Duoprops. It burns very little fuel for I haven't filled up in a year and a half, and still have over 100 gallons left in my 200 gallon tanks. They are all aluminum with the exception of the walls and top deck. All the railings and the 3 stairways are also aluminum. I bought this to live on, but got married and we stay on it whenever possible. We are not new to houseboating, and have now moved up to our newest boat. Sept of 2015 we had our boat transported the its new home and we live aboard as much as our work lives allow. We have a 1984 14x50 twin 6cyl. We have had little to no problems and do not for see any. Well constructed and cared for. I have all the manuals and would be willing to make copies for any fellow houseboaters. Hi Colt, I appreciate the offer to copy (hopefully you know how to scan it) and send us a PDF copy of your owners manual. We can post it on the website and share it to other boaters. Hello. I see from the comments here that everyone has a similar problem that my husband and I are experiencing with the 1989 Hilburn houseboat we just purchased: no owner's manual. If anyone out there does have any written manufacturer's instructions/info about a boat like ours, we would sincerely appreciate the opportunity to own the information. We will pay for it, if you have administrative fees before sharing. Please let me know. Thank you.